Here at Mac Gems, we strive to find you products that are both useful and inexpensive. Now, the definitions of “useful” and “inexpensive” vary from person to person, but I think most readers will agree that $6 is quite inexpensive; and I dare say that many Mac mini owners will find today’s product to be quite useful. Although the Mac mini is a tiny computer, its power brick is surprisingly big; in fact, the mini has taken some flack for the fact that you’ve got a bulky power supply hanging off your desk or sitting on your floor. If you agree with this sentiment, you’ll want to check out Macessity’s Power Grip Bracket ( ; $6). 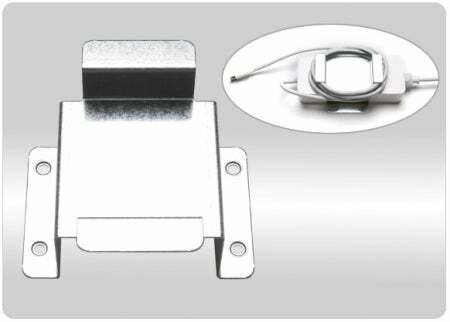 Put simply, the Power Grip Bracket is, well, a bracket , made of galvanized steel, that you attach to the bottom of your desk (it includes the necessary wood screws). You then slide your Mac mini’s power brick into the Bracket, where it fits snugly—up off the floor or down off your desk. Even better, the Bracket includes two large, metal tabs, around which you can wrap the mini’s excess power cord. For only $6, your mini’s power supply is hidden away and you’ve got only as much power cord as you need. I have only two minor complaints: First, I wish the Bracket’s cord-winding tabs were a bit longer; if your mini is very close to a power outlet, you might have a bit too much cord for the tabs to accommodate. Second, it would be nice to see some sort of notch or fastener for securing the cord so it doesn’t unwind on its own. Even so, this is a unique accessory at a great price.